Click on the photo to continue to the album. Gullmarn or the Gullmarsfjord is a 25 kilometer long threshold fjord. 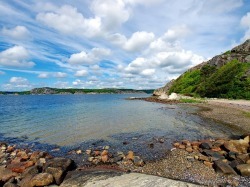 This fjord is Swedens most striking thresholdfjord with an average depth between 20 – 40 meters by the estuary and the deepest point which has been measured is 118,5 meter. The width varies between 1-3 kilometers. Gullmarsfjorden is Swedens first, and at the moment, only marine protection area.